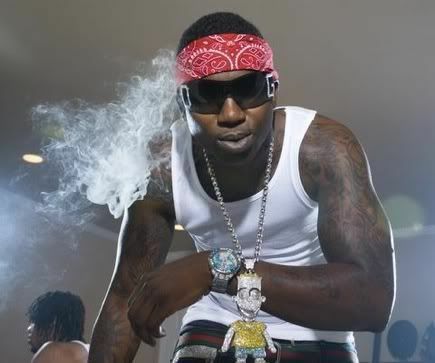 Sources close to the Atlanta rapper say Gucci attended a court hearing earlier today to determine whether or not he�d have to serve time for an unspecified infraction that violated the conditions of his probation. He was sentenced to 12 months, but could end up serving only six with good behavior. Ain't this the clown who busted a woman in the face on stage. Someone sent me a video some time ago - he was on stage with this singer - that he was supposed to be screwing - and his other woman was in the audience so he pushed her off stage. When she came back on stage he punched her. I mean hit her like she was a man. Got no love for this brotha - the need to keep his stupid azz in jail.